The Obama administration is getting little traction in making its case that the government shutdown that began on Tuesday is a serious economic problem. As long as the mail gets delivered, most people don’t have enough direct contact with the federal government to feel the pinch. There is a much stronger case that the president could be making, but is understandably reluctant to do so. Republicans have created a crisis of democracy, which results from their insistence that modest control of one house of Congress – Republicans have 232 seats in the House of Representatives and Democrats have 200, with 218 needed for control – gives them the right to demand enactment of their part of their legislative agenda, especially repeal of the Affordable Care Act. Parenthetically, Republicans only got 47 percent of the aggregate vote for the House of Representatives in 2012, according to the Clerk of the House. In fact, Democrats actually got 1,592,083 more total votes than Republicans did; that results from both gerrymandering and the enormous advantages of incumbency. When I first started working in Congress in the 1970s, I was given a little booklet called “How Our Laws Are Made.” It said that for a bill to become law, it needed to first pass the House of Representatives or Senate and then pass the other house in the same identical form. Then the president had to sign it in to law. Thus making a law requires the combined consent of the House, Senate and president. It says nothing in that booklet about one house of Congress getting whatever it wants when the other house and the president are both opposed to it. That’s not how our system works. It has always been understood throughout our history that this is the democratic process and when a law has been enacted through it that law is legitimate. Of course, this doesn’t preclude litigation in the courts or require opponents to cease their opposition. But the democratic process requires that the law be obeyed unless the House, Senate and president agree to repeal or revise it. 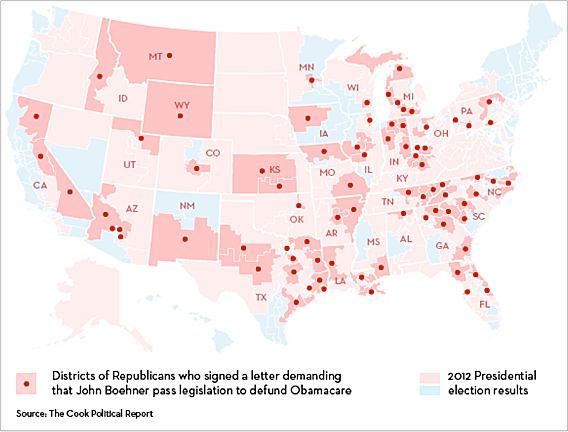 Republicans are especially angered by the Affordable Care Act, a.k.a. Obamacare, which passed the House and Senate and was signed into law by President Obama in 2010. Since then, we have had two congressional elections and a presidential election. In 2010, Republicans gained control of the House but Democrats kept control of the Senate after both the 2010 and 2012 elections. Republican Mitt Romney got 5 million fewer votes than Obama in 2012 and was soundly defeated. Everyone knows this history except, apparently, Republicans in the House, who believe that they are entitled to force the Senate and the president to do what they want or they will hold the entire federal government hostage to their demands by refusing to fund it and possibly defaulting on the national debt as well. The Constitution requires that the government be funded annually through the same process by which all laws are made. And no one is saying that what Republicans are doing is illegal or unconstitutional. But it is undemocratic, sore-loser politics. Republicans respond that “lapses in appropriations” were not uncommon when Democrats controlled the House, and that’s true, as one can see in a recent Congressional Research Service report. As budget expert Stan Collender points out, until 1980 the government didn’t shut down; that results because the Justice Department changed its interpretation of the Antideficiency Act of 1884. Moreover, Collender notes that many government shutdowns took place over weekends without impacting many people, and in many cases Congress had passed some appropriations bills so that the shutdown didn’t affect most of the government, as it does now. In short, what we are seeing today is an exceptionally rare event in the history of government funding. Never before has a party holding only the House been so insistent on getting its way. As military people would say, Republicans are using nuclear weapons in what was previously conventional political warfare. One really has to go back to the Civil War era to find a time when one party was as disdainful of democracy as Republicans are today. Then it was the Democrats, who represented the slaveholding South and thought any means were justified to defend the principle of slavery. A majority held in restraint by constitutional checks and limitations, and always changing easily with deliberate changes of popular opinions and sentiments, is the only true sovereign of a free people. Whoever rejects it does of necessity fly to anarchy or to despotism. Unanimity is impossible. The rule of a minority, as a permanent arrangement, is wholly inadmissible; so that, rejecting the majority principle, anarchy or despotism in some form is all that is left. In that case, the result was the bloodiest war in our history. No one thinks that Republicans today would use arms to resist Obamacare, but they do appear willing to bring down the entire economy and financial system to get their way. That would come from refusing to raise the debt limit within the next two weeks, which will lead to a debt default when the Treasury has no more cash to pay interest. A new Treasury report lays out the nightmare scenario. Washington insiders continue to believe that cooler heads will prevail at the last minute and a financial crisis will be averted. But the crisis of democracy will continue. Every time the budget or debt limit expires, Republicans are going to demand their pound of flesh until voters take away their ability to do so, which won’t be until after the 2014 elections at the earliest.